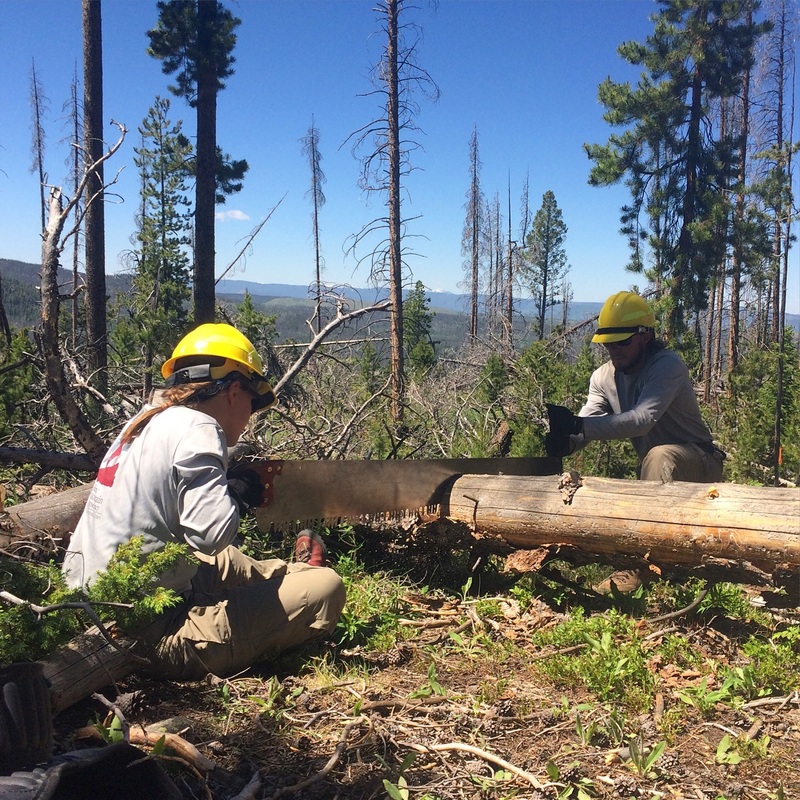 The Shadow Mountain Crew rode across Granby Lake in a USFS boat to pitch camp at Rocky Point for their second week of work. 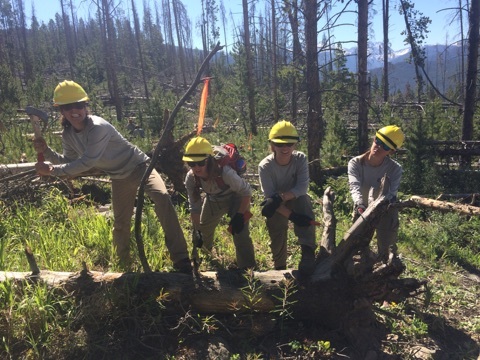 We spent the past week clearing the Knight Ridge Trail, a part of the Continental Divide Trail that has been unmaintained for the past ten years. 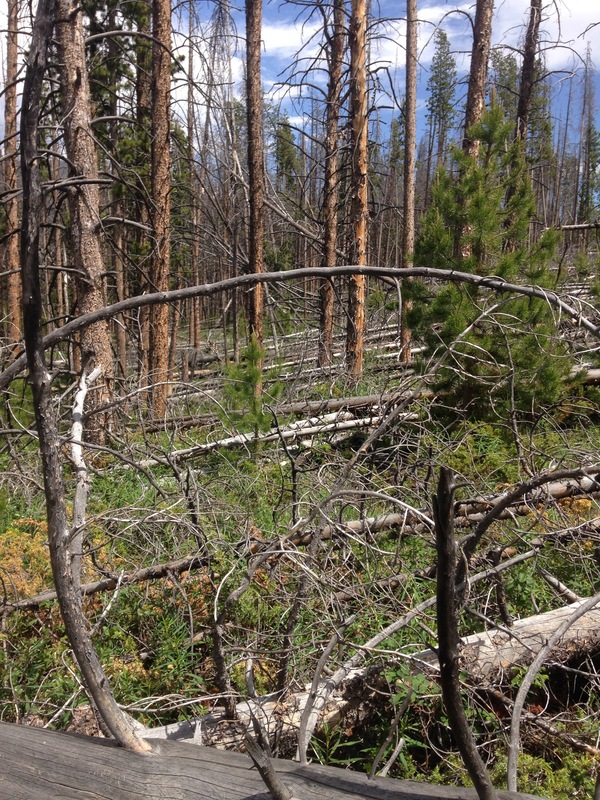 A microburst storm hit in 2011 and blew out about 1500 trees that were dead due to the mountain pine beetle. The Knight Ridge Trail is a part of wilderness, therefore chainsaws and power tools are strictly forbidden. 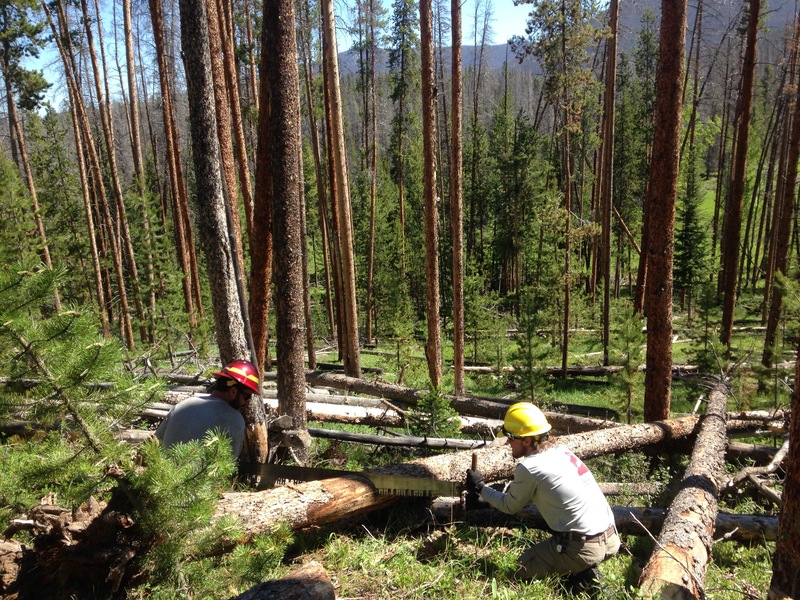 The crew cleared just about 600 of those trees this past week, working in teams of three with crosscut saws. The ridge was such a disaster that trail had to be rerouted at times. We never could have imagined something so horrendous, it felt like a life size game of pick up sticks where we were constantly problem solving. 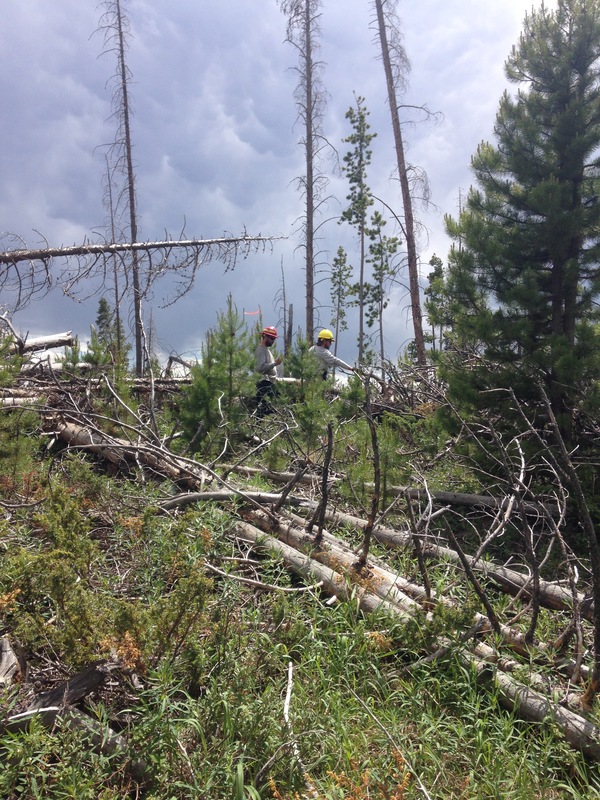 The first day we were swamped with thunderstorms and hail, however worked our way carefully watching the storms to continue the start of our huge project. The next few days continued to be sunny and hot, allowing us to look forward to a swim in the lake at the end of the work day. Our last night out a wind storm hit as we were cooking dinner and we heard even more trees being blown over. The next morning we started our day and counted 30 new trees down on trail we had already cleared! However, it was surreal to have two through hikers pass by us on our final day, they were the only hikers we saw all week and their appreciation for all our work was incredibly rewarding! Our cross cutting is seeing some awesome improvement! This is Shadow, until next time! Making plan of attack atop the Ridge. This last week of work the Red Feather Crew really jumped into it after having two weeks of training we finally were able to get out on to the trail and get some work done. 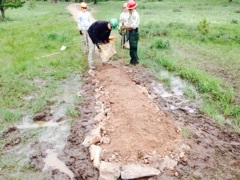 We started with building our first turnpike 30 feet from the Mt. Margret Trailhead. These are elevated portions of trail that have usually been so saturated with water that it is difficult for people to pass through. This meant finding several rocks we could place as boarders around the new trail, flat rocks to fill the center of the trail, gravel and a ton of dirt to make it look like a normal trail. Little did we know at the time that this is what would consume our time for the rest of the week. We would eventually build a total of four turnpikes, a 10 foot one, two 15 footers and the grand turnpike. One that ended up being 90 feet long! Along with building these turnpikes we built 20 check dams and 10 water bars. 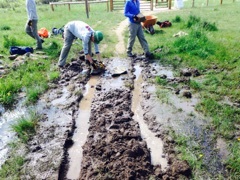 This week we will be working on the Lady Moon trail doing a lot of water work. Til next week this is Red Feathers weekly update, live long and prosper. Damaged section of Mount Margaret Trail before turnpike construction.